The fortieth anniversary of Woodstock is coming up this summer. Got your tickets yet? Or planning just to crash it? I didn’t go to Woodstock. At the time, other diversions claimed my heart. But lots of people I know went. One of them, Gayle Nourse, wrote a short story called “Peace, Man” about her experience there. 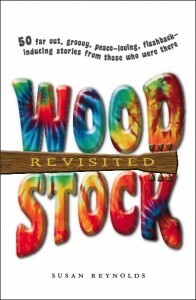 The story was selected to be included in Woodstock Revisited , 50 Far Out, Groovy, Peace-Loving, Flashback-Inducing Stories From Those Who Were There by Susan Reynolds, which will be released this summer, just in time for all the nostalgic hoopla. Love that hoopla. While the original spirit of Woodstock may have been corrupted by the corporate takeover that brought us five dollar bottled water, ATMs and eventually fiery rebellion at the thirtieth Woodstock, the current of countercultural idealism still runs deep and strong. But, while many of my generation recall the heady late sixties fondly, few of us wear flowers in our hair anymore, and even if we may don the occasional tie-dyed T-shirt, it’s not easy to recapture the extraordinary shared sense of innocence and optimism that flourished in those years before the internet, the cell phone and the iPod came along, ushering in a strange new world of insulated detachment. There will most likely be some sort of Woodstock commemoration this summer. But as for peace and love? I wouldn’t count on it. However, that somewhat unhinged but powerfully positive spirit yet lives in Britain, where since 2003 an alternative music gathering called The Green Man Festival offers those who can manage to get there a chance to revel in music, film, theatre, literature, and comedy for three days in the sequestered pastoral Glanusk Park, Wales. The event has already been blessed by the local Druids, to ensure lovely weather for the campers. With its five stages of indie, psychedelia, folk, and “americana” music, not to mention the all-night bonfires and earnest environmental and social justice agenda, The Green Man Festival appears to offer a glimpse of the starry-eyed dream of Peace on Earth. Will we ever see it for more than three days at a time? And will it ever feature better portable toilets? Debbie Harris sent me here from her Facebook, and I’m enjoying the trip. Your well told tales aren’t a glimpse back, but a fast forward. On a whim, I travelled to Woodstock with my girlfriend, Loretta de Marne, and some friends. Expecting a fun weekend with some fine performers, not a seminal event. we arrived just as the fences were being torn down,and gushed in with the multitude of dazed and happy teens. Newly born, drug-free, and stoned on love, we wandered on air throughout the Genesis-Planet that had been so casually created. Woodstock was a love child, kind of a mess,and kind of a miracle. A month later,we parted. Unexpected again. Perhaps the one thing I’ve learned in the forty years since is that the Universe provides, but the timing is not up to us. Loretta and I married last October. Thanks so much for your comment, and congratulations on your marriage! Jay and I were married in October and I’ve always thought it a great month for a wedding. I never knew you were at the first Woodstock. How totally miraculous that your destiny has brought you around to each other again. I’m beginning to realize that I’m going to have to get with the Facebook program. I’ve been dubious about the whole thing for a couple of years, but it seems as if the boat’s leaving and if I don’t get on I’ll always wonder what I missed. Like not going to Woodstock in a way, I suppose. Our son went to the 30th anniversary one, when the ATMs were toppled and the place went up in flames. Things change, life goes on.